Native to southeastern Europe and southern Asia, the pomegranate (Punica sp.) is a small fruiting tree that enjoys tropical and subtropical to warm temperate climates. The pomegranate tree is hardier than citrus fruit trees, with most species and cultivated varieties tolerating winter temperatures as cold as 10 degrees F. The pomegranate tree often grows in a dense, shrub-like form and reaches 6 to 12 feet in height with thorny branches. When trained as a tree, the pomegranate can grow up to 20 feet tall. Pomegranates bloom in small bright reddish-orange flowers and produce small fruits with leathery skin and seedy, juicy pulps. Plant your pomegranate tree in early spring. Choose a planting site in a warm spot that receives full, direct sunlight. Pomegranates grow best in well-draining, deep, fairly heavy and moist soils with a pH of 5.5 to 7.0. Prepare the planting spot by removing all grasses, weeds and other debris. Loosen the soil to a depth of at least 12 inches using a pitchfork, shovel or rototiller. If your soil is sandy, mix some organic compost into the planting bed. Remove the pomegranate tree from the nursery container. Rinse off the potting medium from the pomegranate tree’s root ball. Dig a planting hole for your pomegranate tree that’s the same depth as and twice the width of the root ball. Set the tree’s root ball into the hole with the pomegranate tree standing straight upright. Backfill the planting hole with the displaced soil and water the area around the root ball deeply and thoroughly. Soak the soil around the root ball to remove any air pockets between the soil and roots. Build a ridge of soil above the ground in a 2-foot diameter circle around the pomegranate tree to create a watering ring. Make the soil ridge 3 to 4 inches thick and tall. When watering the pomegranate tree, simply fill the ring with water and allow the water to drain. Water the newly planted pomegranate tree once every two or three days for the first three weeks. Gradually decrease the watering frequency to once every seven to 10 days during the first growing season. Keep the area around your newly-planted pomegranate tree free of weeds and grasses by hand-pulling or shallowly hoeing away the weeds. 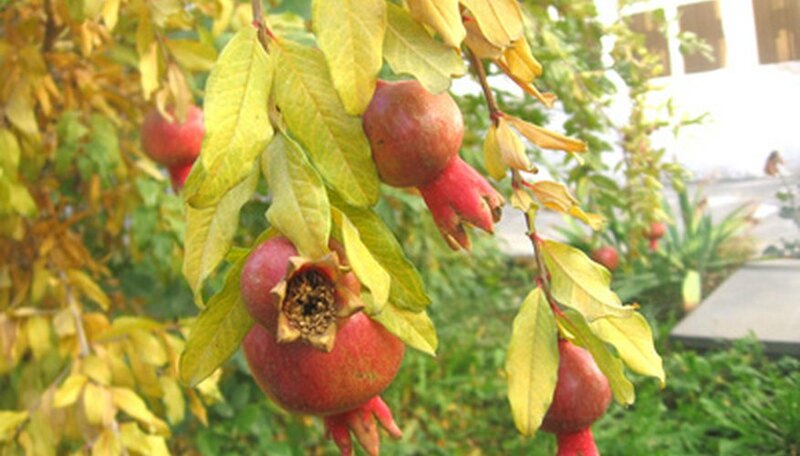 Spread a 3-inch-thick layer of organic mulch on the ground in a 2-foot diameter circle around the pomegranate tree. Don't begin fertilizing your pomegranate tree until new growth begins again after planting it. Feed your newly planted pomegranate tree with four equally spaced ½-cup applications of ammonium sulfate during the first year. Alternatively, you can apply 2 lbs. of 8-8-8 NPK fertilizer after planting and in November.